Stromae may not be French, but he sings in French. An Anglophone music lover, and friend of mine, rejected him at first tune because he was "too French". French is Cool! Kanye endorsed Stromae with a mix they made together. 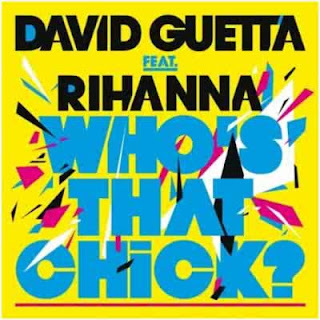 DJ David Guetta is perhaps the most famous DJ out there today. He is quintessentially French. His party demeanor is Saint Tropez all the way! I have seen many documentaries about him and discovered his typically French upbringing. He has had to endure Alphonse Daudet and write in cursive with a ink fountain pen like the rest of us. Look at the creativity that the system delivered! Rihanna has agreed to mix with him in the latest Whose that Chick Single. This is the tip of the iceberg. France has the top DJs of the world. Ed Hardy and French DJs go hand in hand. Christian Audigier Americanized his brand but he is a bling French man at heart. 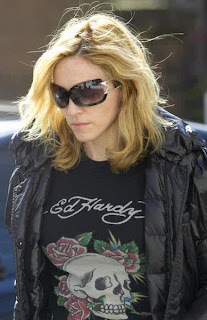 I thought his Swarovsky studded Tigers, Skulls and Bulldogs would go out of fashion, but Madonna doesn't think so. Neither do people in Las Vegas, Miami and Dubai. For those who aren't as bling as Ed Hardy but are still looking for a rockin'roll look, the brand Zadig and Voltaire is the right choice: provided you agree to dress like a French woman, that is in a simple skimpy flower dress and cowboy boots. 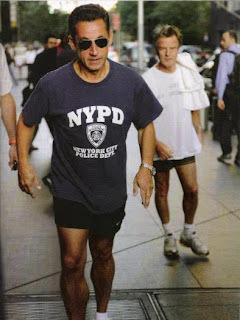 I am surprised President Sarkozy hasn't been caught in an Ed Hardy sweatshirt or a Zadig and Voltaire Cashemir! He sports Ray Bans and Rolex watches and has taken up "footing", that is French for running. The bling President Sarkozy, hot tempered, has made presidential style casual before Barack Obama whose latest was calling Kanye West a jackass!!!! Only a French President would have pulled that off. This was a good posting! What is interesting is that the Americans are in love with France and the French are in love with the US. It's a love affair that's been around for a very long time, and although there is some disdain toward one another, there is a lot of admiration also. Look at this pic of Sarkozy, with an NYPD t-shirt, jogging like a US president. In this case, it's not that French is cool. It's American that is cool, and this French president is taking on a US persona. Think of how excited French people get at the GAP, or at Abercrombie. Remember their awe for all things Levis and those Harley boots they all wore in the 90s? If you want to check a trend in music or fashion,you better try my 4 1/2 year old grandson.Amongst all the kids I have known,this kid got his taste in music or "muthiqa" as he says it in fusha Arabic,from an early age.He is fascinated with numbers also,where No#11 is his favorite.We should remind him that this year is special.New Year was 1-1-11 while today is 11-1-11 and in November it will be 11-11-11.He is also so particular about the hooded sweatshirts he wears,and the cool glasses he adorns.Miro who is studying French,will probably love Rai when he goes back to France this year. I would have called this entry "the French are avant garde. Avant garde is after all a French word. The French have given us la Nouvelle Vague in cinema (before the word New Wave even became popular in British music) with Godart and Truffaut. Et Dieu crea Bardot. Gainsbourg's extremely varied musical style and individuality made him difficult to categorise. The blogger also forgot to cite in music Jean Michelle Jarre, Daft Punk, Laurent Garnier, AND Mirwais. In fashion, Coco Channel, Yves Saint Laurent, and Gautier. I could go on and on. The French are so cool they even gave us La Revolution!